A story often told by civil engineers is that if you looked up ‘Boring’ in the Yellow Pages, it used to say ‘See Civil Engineers’. Of course, this was in recognition of their expertise at making big holes in the ground. Civil engineers didn’t like to mention that the joke wore thin, partly because, as the name implies, they’re very polite, and partly because abrasion monitoring is more of a mechanical engineering job. In 1996, though, at their request, the entry was finally removed. Today, the Yellow Pages itself is being expunged, with the last printed copies going out in January 2019. 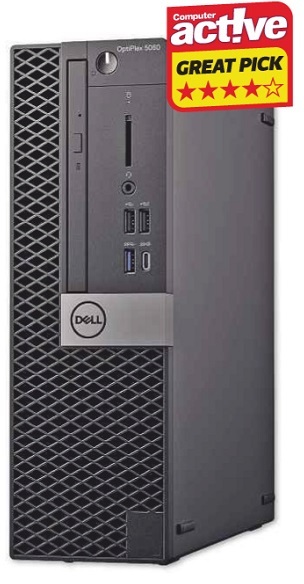 But if there was a Yellow Pages for computers it would say, ‘Civil Engineers – see Dell OptiPlex’. At one end of the company’s product range, you see, are the Alienware gaming PCs, with their boldly sculpted cases, go-faster grilles and glowing LEDs. At the other end is what appears to be one of those small plastic crates that greengrocers leave in the street after a market, painted black. And that’s the OptiPlex. We’re just kidding about the crate: civil engineers would appreciate this tower system’s build quality, even if, like the fact that you’re a civil engineer, it’s not something you’d want to show off. This model comes in the Small Form Factor case, smaller than the Mini Tower but larger than the Micro Form Factor. Happy standing up or lying flat, it’s easy to open up and big enough on the inside to add low-profile PCIe expansion cards. The supplied 500GB hard drive fills the only drive bay, but you also get a DVD writer, a blast from the past that may still be useful for watching videos or burning your own. There are plenty of USB ports, including a Type-C among those on the handy front panel; less handily, this is the only one with USB 3.1 Gen2 (10Gbps) speed for fast external SSDs. Monitor outputs are limited to two DisplayPort sockets, with an extra-cost option for HDMI. You can add an SD card reader. A very basic but usable wired mouse and keyboard are included. We tested a configuration that paired 8GB of memory (RAM) with 16GB of Intel Optane ‘memory’, a kind of very fast storage that acts a bit like RAM. In our tests, this boosted the hard drive’s read speeds into middling SSD territory but had no discernible effect on write speeds. The M.2 socket used for the Optane chips can alternatively support a fast NVMe SSD, which would boost performance more. A 256GB option with no hard drive, or for the same price you can double the hard drive capacity. It could make more sense to add an M.2 SSD yourself, such as Samsung’s 970 Evo, and move Windows on to it, keeping the hard drive. Windows 10 Pro is supplied. The decidedly unboring part is the six-core Intel i5-8500 processor, which gives the kind of performance previously reserved for top-end i7 systems. There’s no graphics card, and this isn’t a system you’d shoehorn a fancy one into, but the integrated Intel UHD Graphics 630 GPU covers the necessities, making this a solid desktop workhorse.